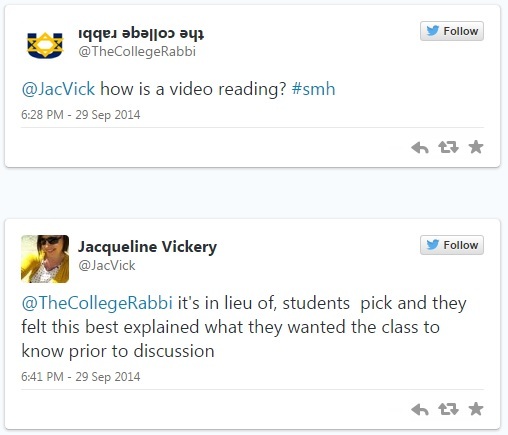 A social media professor defends her class against a rabbi | Jacqueline Ryan Vickery, Ph.D.
Twitter is a crazy world that leads to all sorts of interesting interactions, usually welcome, but occasionally not so much. 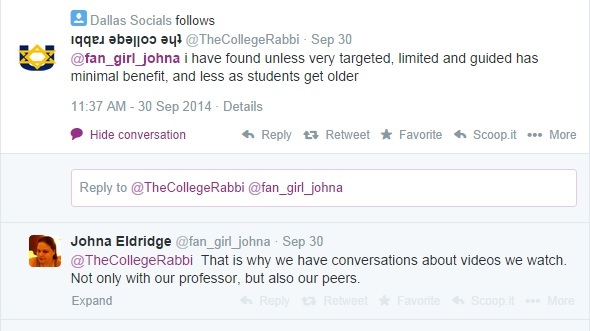 Here’s the setting: Some time ago @TheCollegeRabbi began interacting and following me on Twitter. I believe our first interaction was when I posted the results to a Pew religion quiz I took. I missed a question about Maimonides and he felt the need to explain the answer to me via Twietter (nevermind I’d already Googled it for myself), and bring it up again on his blog. Apparently since then, he has been following me. I do not follow him back, but he likes to engage in debates with me via Twitter. We’ve had several rather confrontational conversations on Twitter about various digital media issues, nothing too noteworthy…until this week. After I defended my use of a video for class, I anticipated he would continue to interact with me and I prepared my snarky response about not really appreciating unsolicited opinions (from non-professors at that). But I decided not to escalate the situation, so I let it go. Well, several hours later he responded with a link to a blog post about me and my class. It’s called “A College Rabbi Audits a Social Media Strategies Class.” Rather than just considering the pedagogical value of a video, he directs the entire post at me, my course, and my students. While he makes some valid points, he also makes a lot of assumptions about the course (without having ever discussed it with me) and overlooks the realities of teaching in a diverse classroom of learners (some of whom are struggling just to master the English language, much less digest jargony academic writing). Since he has taken it upon himself to “audit” my class (more accurately, to assess one part of one assignment with an often condescending and elitist tone), I feel compelled to respond to his assertions and assumptions and to defend my pedagogy, my course, and my students (who are accused of “flushing money down the toilet”). First, I need to explain the use of the video in greater context. The majority of this particular class is comprised of group work. One of their group assignments is to lead a class discussion on a topic of their choice. I used to assign the topic and reading and ask the group to teach it. 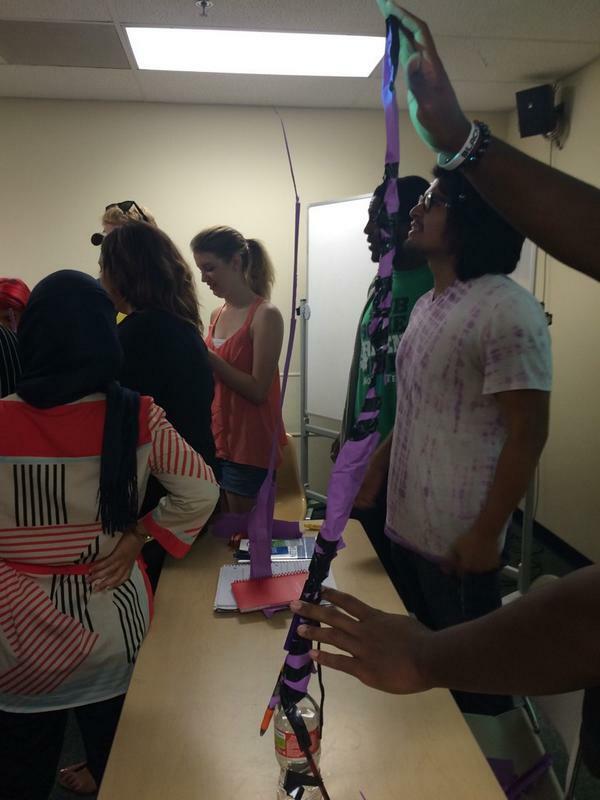 This was mostly successful, and they came up with great ideas – like building paper towers as a way to explain social capital (ask if curious). I believe students should have a say in what they are learning. The classroom should be a space that fits seamlessly into the rest of their lives. I do not want the classroom to be a learning space they enter as something wholly separate from what they are doing the other 22 hours of the day. Rather I want to create an environment that fosters productive conversations that are relevant to their lives. Allowing them to choose topics is one way to do this. Leading a class discussion requires them to teach themselves about a topic and then find a way to teach it to others. Research consistently demonstrates teaching something is an effective way to learn. Oral presentation skills. At faculty meetings we often discuss what skills and competencies our students need, oral skills always come up. I give them several opportunities throughout the semester to practice public speaking. College classrooms should be a space to discuss issues that are important to students. As a professor, part of my job is to guide these discussions, add nuance, history, and complexity to matters that are relevant to students’ lives. The video explained and contextualized net neutrality in an effective and engaging way. The reality of teaching is that students are only going to do so much. Had we assigned the reading and the video, only a few students would have done both. Most students would have just watched the video. Now you can lament this reality all you want, and tell me it’d be great if students would do both, and how good it is for them to also read, and how I’m lowering my expectations and yadda yadda yadda – and I’d agree with you….in theory. But getting students to read is a continual challenge, and in this case I knew we were facing an either/or situation and I decided the video would suffice as a way to provide context prior to the discussion.The point of this assignment is not about reading, but about getting students to take charge of their learning, to bring in relevant material, and to practice teaching/oral skills, alongside a critical discussion. A video enables this. In college, there’s only one real goal: prep students for work or higher education. This is what parents, and students who pay their own way, are paying for. Therefore, doing anything but pushing students with challenging assignments is the only way to do it. Students must be forced to read academic writings as much as possible because they need to both learn the vocabulary and endure the rigor. I have to completely disagree with the first part of this statement, the goal of higher education is so much more than merely preparing students for a job. That’s what trade schools are for, and that’s a great option for a lot of people (in fact, I wish the U.S. education system provided more viable pathways in high school and post-graduation for non-college routes). However, college is about the higher part of higher education. My goals are to not only prepare students for the workforce (something I know my class does and I will address in a bit), but rather to also prepare my students to be responsible and contributing members of society, in all aspects of their lives, not just as potential members of a capitalistic workforce. I strive to challenge my students’ biases and ideologies, to help them understand and empathize with other perspectives, to assess data and research through historical, analytic, and contextual lenses, to expose them to diverse opinions and experiences, to enable them to think critically, to encourage them to never stop questioning how things are, and more importantly, how things could be as they strive for a more equitable and democratic society. In other words, to be an all-around educated, thoughtful, responsible, and contributing member of a global society. Arguably this can be advantageous in the workplace, but I’m not training workers, I’m helping guide global citizens whose lives and intellect and experiences matter infinitely more outside of the workforce. So there’s my thoughts on that part of his argument. Now, back to the use of a video in lieu of one reading in one week of one semester (nevermind they also have other readings this week, both academic and otherwise). My students are MEDIA students, I am a MEDIA studies professor, and my students are MEDIA makers. In other words, we value media a lot, like a whole lot in this department. As such, my students learn via media, like a lot, like every day. 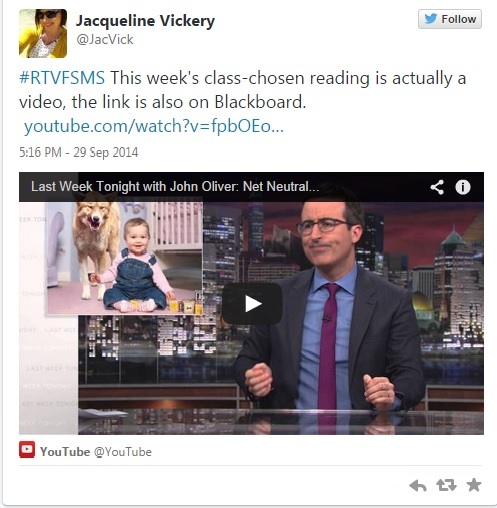 It would be completely ridiculous for me to ignore video as a learning platform. They should learn via the very same medium they themselves are producing. The College Rabbi gives a brief overview of different pedagogical perspectives, I’d like to point out another: Connected Learning (full disclosure: I’m an Associated Researcher for the Connected Learning Research Network, wrote my dissertation about this, and am working on several other publications about this approach to learning). Connected learning takes a 21st century approach to how students prefer to learn. For too long school has been an obligatory aspect of students’ lives that is not integrated into their other learning spaces, passions, interests, and modes of engagement. Connected Learning strives to connect students’ interests within the formal learning environment. Research demonstrates that students are tired of their self-driven modes of learning being invalidated in the classroom. Rather than telling students they are learning “wrong” outside of school, I believe we ought to find ways to leverage their self-initiated skills, toolsets, interests, and modes of engagement inside the classroom too. Today’s students are very adept learners, yet they still need guidance. This is how I situate my classroom – as an integrated aspect of their learning ecology and as a space to help guide their learning. A learning ecology approach recognizes that home, peers, school, interests, and technology are all integral aspects of how, where, what, and when students learn. Relying on antiquated modes of learning simply because “that’s how we’ve always done it” imposes rigid and unnecessary limitations onto learning. I’ve been reading Coppleston’s A History of Philosophy (veeery slowly) and you would not believe what hoops people had to go through to get their baccalaureate 400 years ago. Besides for knowing the classical languages (Hebrew, Greek, Latin) they had to increase the body of knowledge by producing original works. Thems days is long gone, and definitely to our detriment. We aren’t producing the kind of student we were even 100 years ago, and we totally could if professors took the position that education must increase your knowledge base, take you outside of your comfort zone, and make you sweat a little too. Well, yea things have changed in 400 years, or even 100 years. Let’s just start with the fact that more than half of my students weren’t even allowed to attend the same universities as their white peers 100 years ago. Close to half my students were highly unlikely to pursue a college degree because society structured their life options around marriage and babies. So yea, things have changed a lot in the university in the past 100 (or 400!) years, and I would say many of these changes are welcomed responses to centuries of structural injustices. I say all that to say, no kidding curriculum has changed. It’s great (I guess?) that students used to have to jump through way more hoops to get a degree (not least of which, be a white man), but how is that productive today? If we’ve “lowered” our standards (not requiring Greek, Latin, and Hebrew), I think it’s also in an attempt to make education more accessible to a wider population of students (which in turn leads to a more equitable and democratic society, not a dumber one). Additionally, it’s in response to changes in the workplace and broader societal changes in general (how marketable is a Latin student today? Not very). So to rely on tradition to make an argument is a rather fallacious and narrow-minded approach to learning. Of course we used to rely on reading more, cuz uh, that was basically the only tool in our toolbox (alongside oral and experiential learning). Today we have so many more tools through which students can and do learn, when critically integrated into the classroom. Videos are a part of that. That’s why allowing students to assign themselves a video is a joke, particularly a video of something they’d likely watch on their free time anyway. It doesn’t challenge them, expose them to anything new, or expand their minds. Well, the fact that they would likely watch this anyway further iterates my stance on creating a Connected Learning environment. Yes, maybe some of these students would have watched this on their own, that’s great. My role as an instructor is to create an environment where students can discuss media with their peers and an instructor in a guided, nuanced, and critical way. Like all of us, they are bombarded with media all the time and they need (and are seeking) spaces to engage in conversations about these messages. This is why we dedicated almost an hour of class time (in my other class) to discuss the Ray Rice incident: because students are watching and listening and producing, and they want help making sense of this crazy media-saturated world. Outside of a mediated context, we also got to discuss domestic violence, an important issue higher education ought to (and is at times obligated) to address in certain classrooms. I was grateful for the opportunity to help expand the ways my students think about how media constructs dangerous narratives of victimhood, masculinity, and violence. Further, despite the Rabbi’s claim, the chosen net neutrality video does expose and challenge them. Again, we are a MEDIA department, we critically engage with and deconstruct media all the time. It’s kinda what we do, it’s our thing, and we do it well. We discuss everything from production to political economy to content to reception to ideology to history and so much more, that’s what a media department does. Now, I do agree that students need to read, and read a lot. I’m an avid reader both inside and outside of my job. That’s why I spend weeks preparing a syllabus that includes readings. There’s obviously a lot of value in reading and students get that too. Students must be forced to read academic writings as much as possible because they need to both learn the vocabulary and endure the rigor. As one student poignantly noted, “It’s not like making us read an academic paper will magically motivate students to learn.” And I take issue with the assumption that students need to learn academic jargon. Unless they are pursuing a career in academia (which, I cannot with good conscience recommend to the majority of my students, given the current financial crises in academia and the wavering job market), they do not need to know academic speak. What they need is the critical thinking skills to formulate arguments and construct critical analyses, which they learn alongside and outside of academic writings. I value academic writing a lot (obviously), but, and it’s a big but, I do not think we should privilege written texts as the always-superior mode of learning. There are times videos, images, writing, conversations, presentations, social media, media production, and creativity are far superior to the written text. This week’s net neutrality discussion is one small part of a much larger class that isn’t focused on media regulation. My Social Media Strategies course is largely a practicum, not a theory/research course. However, going back to the goals of high education, it’s imperative that students don’t just learn the skills required to be effective communicators, but rather they understand the context and theory in which their practices are embedded. This is why we spend the first five weeks of the class discussing social capital, social network analysis, convergence culture (using academic writings) and why we study media industries’ policies, ethics, and business models – because I want them to leave my class with so much more than just skills. This week’s net neutrality conversation is a way to weave in broader conversations about social/digital media outside of what is already included on the syllabus. We go into much more depth about this in my Digital Media & Society course, which is a research and theory course. But for the sake of Social Media Strategies course, we are only brushing the surface of the topic, because it’s not the primary focus of the course. I’d rather expose them to different issues (that they choose) even if only briefly, than not address them at all. A video is an acceptable way of learning about this issue as part of a broader discussion. The video is a starting point, not the assignment in its entirety. Almost done, but I also want to include my students’ take on all of this. I showed them the tweets (which many had already seen since the Rabbi used our class hashtag) and printed out the blog post for them. I anticipated they would be quick to defend the use of a video, but I underestimated the fervor of their arguments. They were livid that someone (a non-student of my course and non-professor) would dismiss their preferred modes of learning. They were defensive that their entire degree was being called into question (“he knows we’re film students, right?”), that they were accused of wasting money, and that he was “weeping” for their generation. As one student noted, “I wouldn’t learn as much or care as much about this class if you only made us read academic stuff. I look forward to this class because it’s so engaging and so relevant.” Another student remarked, “This is a media course, that makes media relevant. Maybe if we were the English department it’d be different, but yea, we learn with media.” My students also took advantage of my “livetweeting in class” policy to engage with the College Rabbi during class time (we had the stream up on the projector). I encouraged them to be respectful, attack his argument, and defend their own perspectives, but NOT to attack him or escalate the situation. Overall I think they did this well; they were emotional and passionate about this, but I think they kept themselves in check. The students did a nice job calling out the contradictions of his arguments and demonstrating their own “jargony” film knowledge (i.e. one student suggested they discuss auteur theory together). The point wasn’t to shame the College Rabbi for his clear lack of film theory knowledge, but rather to demonstrate that film students are capable and expected to engage with critical and nuanced rhetoric all the time. Finally, to address the Rabbi’s assertion that students aren’t prepared for the workforce, well, I’ve had several students get jobs in part because of, or directly as a result of, my courses. This includes social media jobs in: the television industry, the film industry, the non-profit sector, fitness industry, insurance and other fields of business. So many students have emailed me to say, “I just got this job and I want to thank you so much for everything you taught us, it’s the reason I got this job.” (warms the cockerels of a professor’s heart). So while I don’t appreciate unsolicited advice from someone I’ve never met, and from someone whom I’m not sure has actually ever had to deal with the realities and logistics of teaching a classroom full of diverse students, I will acknowledge that this was a great learning experience for my students. We used the tweets and the blog post as an opportunity to discuss pedagogy (something I strive to make transparent to my students) and as an opportunity to discuss how to appropriately respond to such situations. While they were quick to jump to my defense (thanks guys! ), we also used this as an example of how tweets and social media can be taken out of context. The tweet that started this was of course public, but intended for my students. It was then copied and pasted onto a blog and shared in a different context than I intended. These are the complexities of social media (can be positive or negative) and we were able to use this as a learning moment to think about context, publicity, networks, and social media. So there ya go, back to tweeting and reading and video watching for us all!